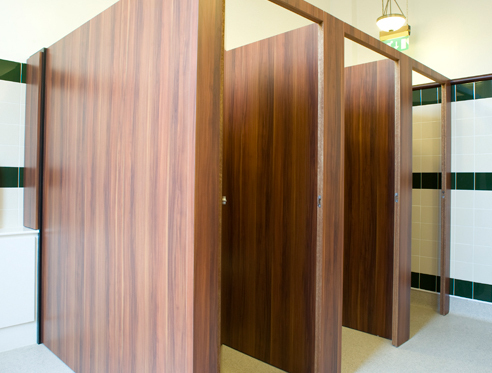 The Emerald range of washroom cubicles is specifically designed for the aggressive leisure market. High volumes of users and constant abuse can shorten the lifespan of the most robust cubicles, however these cubicles are able to withstand even the most demanding situations. Suitable for all wet and dry environments, the system presents the perfect solution for all public shower, changing and washroom developments. Already installed extensively in swimming pools and leisure centres throughout the UK, this system has an enviable track record for durability and performance. The system can be combined with our locker and seating systems to provide a complete changing room solution. Solid luxury appearance and high performance. Creative and distinctive, decorative design. Extensive colour selection. Anti door slam and vibration pads. The cammed door hinge allows the door to stand open, fall closed or sit ajar. Suitable for disabled door configurations Installer friendly. Approximately 96% of people registered blind or partially sighted have some degree of vision. In order to make the most of this residual vision, contrasts in colour and more importantly luminance can be employed to help identify objects and avoid hazards. Complying fully with the requirements Documents M Part 3.10 d & e, the lock can easily be operated with a closed fist, and is therefore suitable for use in all W.C. and changing rooms. Choosing from the collection of laminates available in our colour collection brochure, it is possible to use compact grade, or high pressure decorative laminate panels, which are both exceptionally strong and durable. Offering excellent resistance to vandalism, the panels are suitable for all high or low use, wet or dry areas. Coloured matched mild steel or uniquely designed tubular aluminium bench seating is available; hook boards and compact grade seating elements ensure the system maintains a continuity throughout. Aluminium seating has the additional benefit of completely eliminating the risk of corrosion. The raised headrail possesses qualities of strength and stability combined with intricate design. It is held in place by supports attached to the pilasters and partitions. This support features the same ringed pattern that is engraved around the leg to ensure continuity of design. The faceplate features a modern, slim design that includes a visible, easy to use slot operated external emergency release facility. With no visible fixings the faceplate attracts no attention from vandals or young children.